Built and launched by the American Shipbuilding Company of Cleveland, Ohio in 1902, the Milwaukee was a robust train ferry with a length of well over 300 feet and a weight approaching 3000 gross tons. 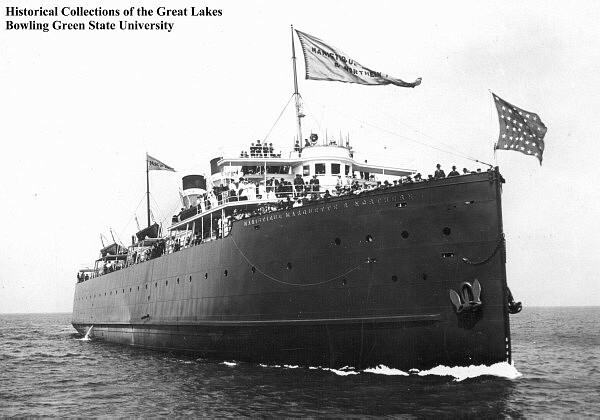 She served the Great Lakes proudly for closing in on three decades when she ultimately met her fate on what would have been a short jaunt to Grand Haven. During that trip she was met with a fall storm and disappeared. Over the next few days a couple of lifeboats and bodies were found floating in the vicinity. Five days later, on October 27th, an empty lifeboat was found with the ship’s message case floating nearby. In the case a message was found that stated; “Oct. 22, 1929. 8:30 pm. The ship is making water fast. We have turned around and headed for Milwaukee. Pumps are working, but sea gate is bent in and can’t keep the water out. Flicker is flooded. Seas are tremendous. Things look bad. Crew roll is about the same as last payday. A.R. Sadon, Purser. Another note, found in a bottle, read: This is the worst storm I have ever seen. Can’t stay up much longer. Hole in side of boat”. When all was said and done, her entire crew was assumed to have gone down with the ship, with only 15 bodies of the 59 crewmembers found. She was finally discovered in 1972 by a group of divers. Sitting upright in 120 feet of water, she is a great wreck for the intermediate to advanced recreational diver to explore. We visit the S.S. Milwaukee from her namesake, Milwaukee.